Sunday, Joe left for St. Louis. Tuesday, I left for St. Louis. Two totally unrelated business trips - Joe worked at a project site near the airport, and I got psychoanalyzed for management potential in Clayton. No worries - I'm not sold out to The Man yet - not only did I make sure to talk to the voices in my head throughout the interview, but I remembered to answer all the "do you like to harm small animals" and "are you fascinated with fire" questions affirmatively. Besides - rumor has it that The Man is selling out before I can. Fun trip (hey - it was 3 days out of the office) with lots of knitting time in airports and on planes. Met up with Joe for dinner, came back Thursday, and have been exhausted ever since. Made with Brooks Farm Primero (100% kid mohair) that was given to me by the lovely Lorena after Rhinebeck last year. 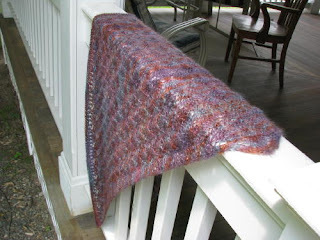 Pattern: Blue Jeans Lace Leaf Shawl. 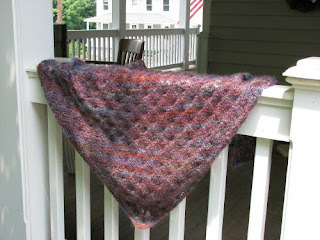 The shawl is beautiful! We will get pictures of you wearing it, right? I was just asking Justin the other day if that was your company up on the chopping block. He said, "Doesn't she work for Pepsi?" So behind the times. Wonder if your friends' wedding had those incredible thunderstorms yesterday. Hope they didn't get rained (or hailed) out. Hey - How Was That Wedding...?